View example usage in the video below. 1. Create slope patterns. You can move grip points and the patterns will update. Note that when moving the top line vertices, they will rebuild in real time, but when you move bottom line grips you must REGEN the drawing after that. 2. Change parameters if you need to adjust the pattern. 3. You can toggle the display of the patterns. Delete slope direction patterns. You must select the top slope line. Edit slope patterns. First select the top slope line and edit the parameters in the dialog box. 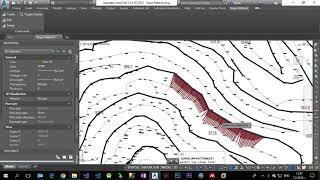 Create slope direction patterns. 1. Enter required parameters in the dialog box. 2. Select Top slope line and press enter or right mouse button. 3. Select Bottom slope line and press enter or right mouse button. Toggles the visibility of slope patterns. On start-up the subscription will be checked. You must be online to use the plugin. The app is compatible with versions 2015 and up. Note that slope patterns in the drawing are not shown if the plugin is not loaded, but they will appear after loading the module. Company Name: Benovi Engineering, Ltd. Please write to benov@benov.org with questions, suggestions and everything else if need support.